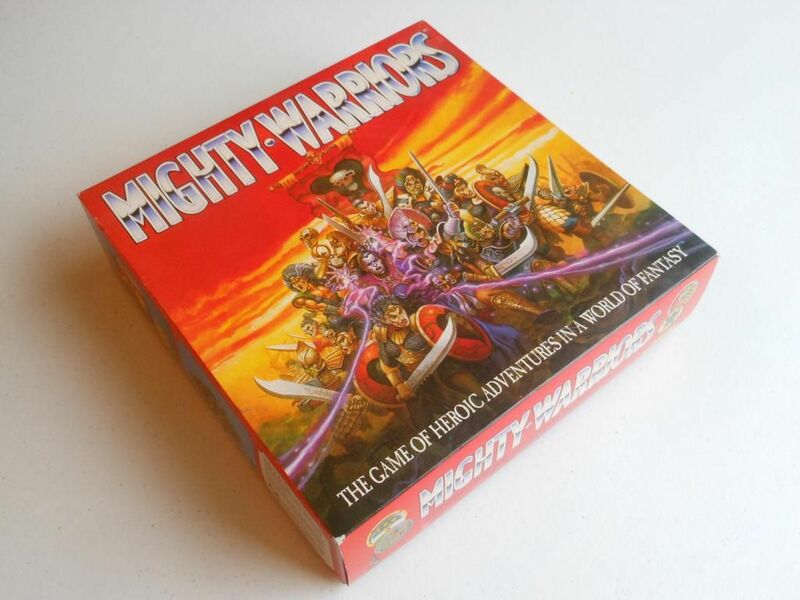 This review of Mighty Warriors originally appeared on www.BoardGameGeek.com in June 2011. This is a slightly edited version which I hope reads a little better than the first effort. And if you were wondering: yes, I do still own this game; and no, I haven't played it since. You will note how the box art has bugger all to do with the game. 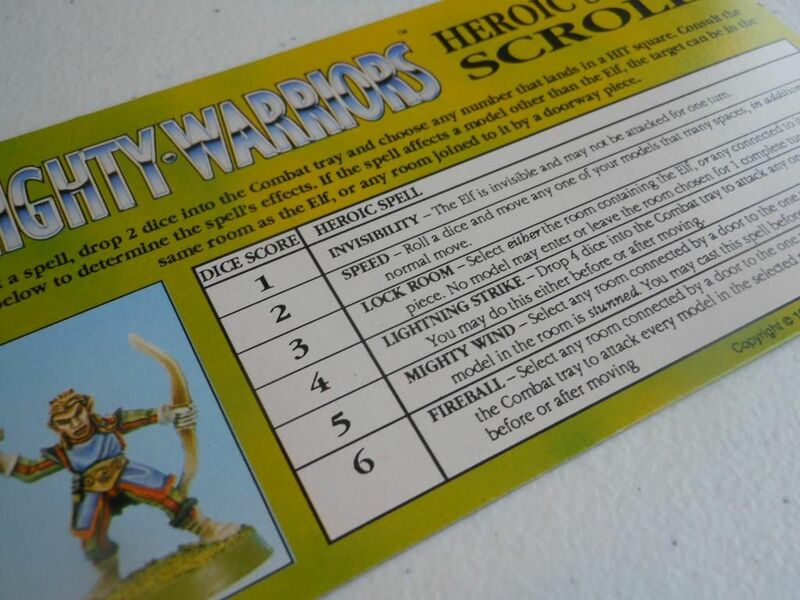 Before I begin, it should be noted the only reason I have Mighty Warriors in my collection is because a few years ago I bought an incomplete copy of Advanced Heroquest on eBay for pennies. The game was missing all the hero pieces and about half the skaven and henchmen. A good friend of mine knew this, and gifted me his mint condition copy of Mighty Warriors. Why would he do that? 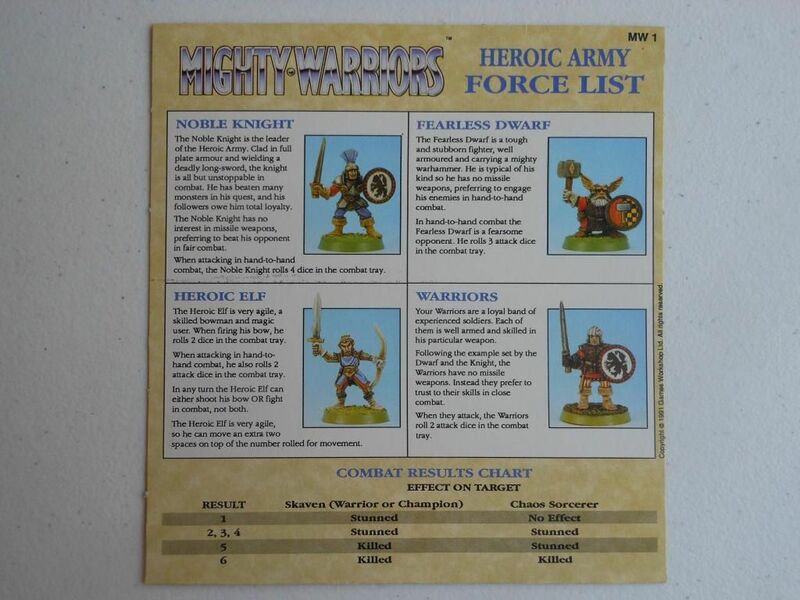 Because Mighty Warriors is a game that appears to have been released (back in 1991) with the sole purpose of enabling Games Workshop to pack up and sell surplus stock of the figures that came with Advanced Heroquest. 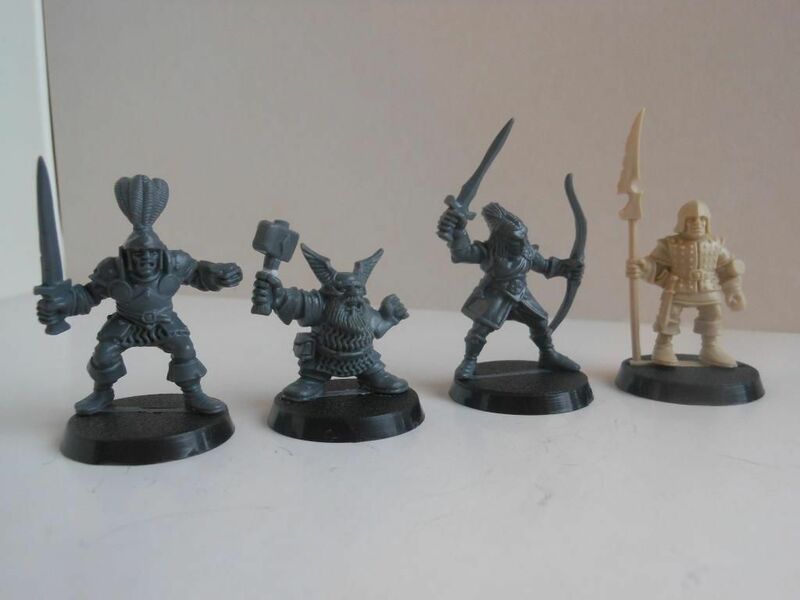 So, let's start with a brief rundown of the miniatures you get: One elf, one dwarf, one knight, one wizard, 20 skaven (four with different coloured bases to denote champions), and 12 henchmen. These miniatures are great. I believe they are some of the finest GW ever produced for a game. They look good on the board, and they are also totally functional (they don't get all tangled together like those damned genestealers in first edition Space Hulk). These miniatures actually drive the design of the game. Basically, it feels like the designer was given the miniatures and told to come up with a set of rules to match them. DESIGN FAIL 1: Design miniatures for use with your game, do not design a game for use with your miniatures. As an example of how the models define the rules of the game, consider there are 20 skaven with shields that can be removed. As a result, the rules for Mighty Warriors allow skaven to block hits with their shields (resulting in the shields being removed from the model). More examples: The elf is the only character that can use a bow, because his model is the only one that has a bow. 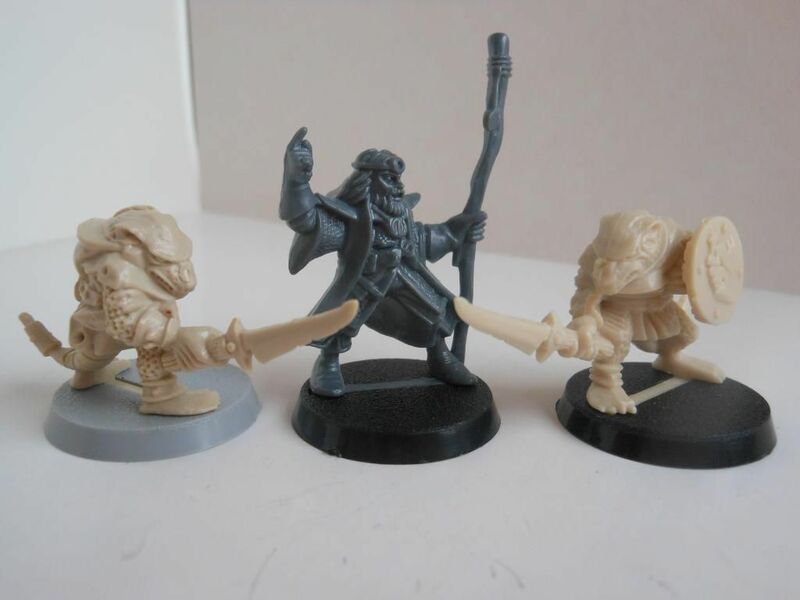 The skaven are led by a chaos wizard - this only makes sense because it enabled the game to use the wizard figure from Advanced Heroquest as the leader of the bad guys. Even the plastic shields for the dwarf and knight are used as "flags" to be captured (rather than being affixed to the models as you would expect). Bizarrely, the henchmen in the game do not have rules for using a shield, so the models do not come with shields, even though each model has a little peg where a shield should be attached! The good guys (note the pegs where shields should go). Besides the models, you get a bunch of floor tiles showing different rooms inside a castle. They are all different designs with a nice, old-fashioned hand-drawn style of artwork. However, the rooms are all different sizes and have thick black borders (which often cut off parts of the spaces on the boards), and this makes it difficult to see how you are supposed to move around and between each room. DESIGN FAIL 3: If you are going to have some spaces on the board that are cut in half, or only have a quarter of the total area visible with the rest taken up by a wiggly bit of wall, give some instructions in the rules for whether or not those spaces count as a real space. To make matters worse, the card used for the boards is incredibly thin, and the boards do not "jig" together in any way. This means the boards will often slide around and move out of alignment, making it even more difficult to know which rooms are linked. 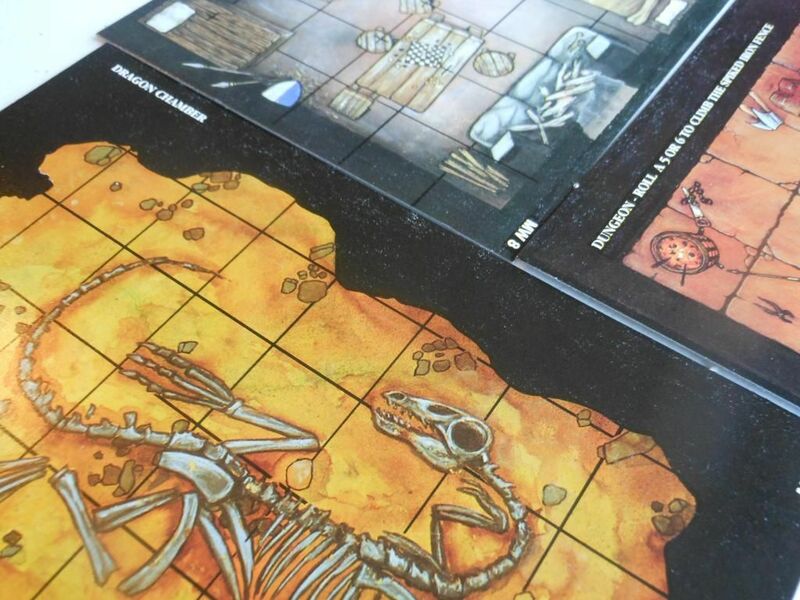 Pieces tend to get knocked over, and you feel a bit like you are playing on sheets of paper rather than professionally produced game boards. DESIGN FAIL 4: If you are going to have a board made up of separate card pieces, use card that is thick and durable. The boards - nicely drawn, but thin. Also note the thick borders. There are also some cardboard doors for showing how rooms are linked together. These are cheap, folded cardboard that fall over a lot and make the doors in Heroquest look top-class. DESIGN FAIL 5: If you are using doors to link separate boards, do not give the boards thick black borders that are so wide it is difficult to tell which two spaces the door is linking. DESIGN FAIL 6: When an element of the rules is that models cannot move through a space containing another model, do not include doors that are only one space wide or you will end up with a game that consists of two neatly lined up armies fighting one on one fights through a single doorway. Finally, you get four dice and the box. Why do I mention the box? Because the inside of the box lid is divided into nine squares labelled "hit" or "miss." Whenever you roll dice to attack or cast spells in the game, you drop the dice into the box lid. Dice that land in a "hit" are hits. This is truly as terrible as it sounds, and it is made worse by the fact that there are five "hits" forming a "+" sign, with four "miss" spaces in the corners. In my experience, it seems that when you throw dice into a box lid, they tend to bounce around and settle into corners rather than ending up in the middle, which means you tend to roll a lot more miss results than you really should. This is just plain annoying. Okay, so I couldn't even get through the description of the playing pieces without bad-mouthing the game. I will try to be a bit more even-handed with the rest of the review of this terrible, terrible, terrible game. Promise. 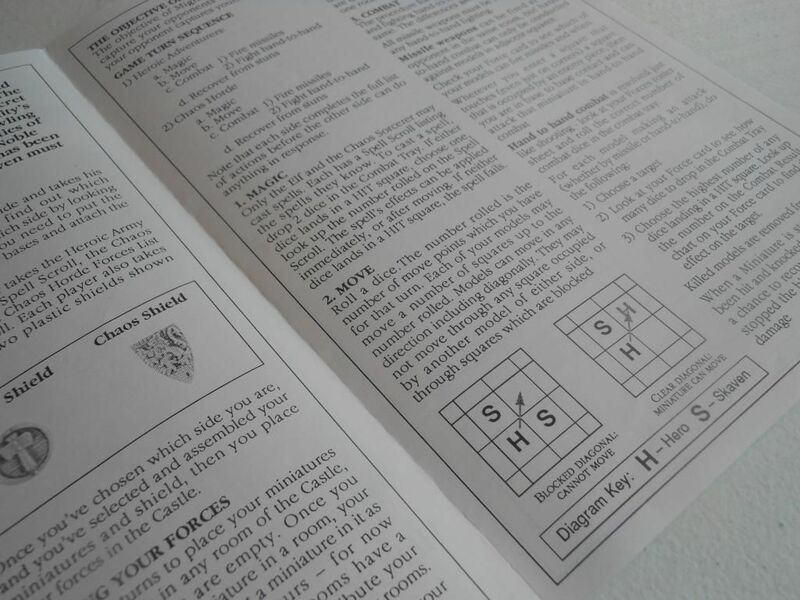 A sample of the rulebook's awesome graphic design. DESIGN FAIL 7: Don't forget to define the winning conditions. The heroes move first, and then it goes in rounds, with both teams following the same steps. First, if your wizard is still alive, you roll two dice into the box lid. If either lands on "hit" you have successfully cast a spell. Pick one dice that landed in "hit" and check the number rolled on your wizard's spell list, then implement the result. The spells vary wildly and range from useless (such as the elf's invisible spell, or most of the chaos wizard's spells) to stupidly overpowered (the elf's "attack EVERY SINGLE MODEL in an adjacent room" spell or his "STUN EVERY SINGLE MODEL in an adjacent room" spell). With the right spells, it is possible for the elf to almost single-handedly win the game. DESIGN FAIL 8: Don't make spells that are stupidly powerful or pointlessly weak. DESIGN FAIL 9: Don't make wizard characters have spells that are only useful in close combat - the last place you want your wizard to be. DESIGN FAIL 10: Don't make spells that are annoying and boring. After spellcasting comes movement. Roll 1D6. Each of your models can move up to the number of spaces rolled. Yup - roll and move. In a tactical skirmish game. Really. How can you form any kind of strategy when the number of spaces you can move EVERY MEMBER of your team is determined by a single dice roll? I lost count of the number of times I set up my team ready for a powerful attack and then rolled a 1 for movement and ended up "closing ranks" and facing an attack from my opponent instead. There really is no excuse for this kind of design. In a light skirmish game, each piece should have a defined movement allowance so you can actually make some plans and strategies. At least that way you would feel like you had some control over your fate. DESIGN FAIL 11: Don't do roll and move. Especially in a skirmish game. After movement you do shooting - well, the elf does, as he is the only one with a bow. He can shoot at any model in the same room. No line of sight. Stupid. DESIGN FAIL 12: Don't have ranged combat if you aren't going to do proper line of sight and range rules. After shooting you do close combat - yay, more dice go into the box lid for a bit more randomness. Your success in combat is down to how the dice bounce. If you hit a skaven they can lose a shield before taking the hit. Skaven without shields will be automatically stunned on a hit and killed outright on a 5 or 6. Strangely, the shields make the skavens harder to kill than anything else on the board as you need to attack them at least twice to be in with a chance of killing them, while any other model can be killed with a single attack (although admittedly, everything else only dies on the roll of a 6 and is often not even stunned). If models are stunned they lie down, and if they are hit a second time they are instantly killed. Quite often you will find that to kill a skaven requires three hits - one to remove the shield, one to stun, and one to kill. Compare this to, for example, the heroic knight character, who has no shield and is stunned on the roll of a 5 and instantly killed on the roll of a 6. Yes, that's right; it is IMPOSSIBLE to instantly kill a skaven with a shield, and yet the most powerful warrior - the knight - has a 1 in 6 chance of dying every single time even a weak skaven hits him. DESIGN FAIL 13: Don't make "weak" units that can outlast hero characters. Finally, after combat you roll for each of your stunned models, and recover them on a 4, 5, or 6. That's it. There is no more. Play until one team captures the opponent's shield (however you decide that should happen) or everyone slips into a coma. Honestly, I cannot stress how much I thoroughly disliked this game (although I have tried my best); but is there anything about this game that I do like? Well - those models are really nice. I love the henchmen. They are nicely detailed, but they are not in action poses so they are very easy to handle and move around. The heroes are similarly well made. The skaven are really attractive pieces and look great in a "swarm." I also like the almost childlike artwork on the boards (although the boards themselves are too thin for my liking). I am sure these boards would also be useful for anyone who plays Dungeons and Dragons or some other roleplaying game. The game plays cleanly enough. There aren't many rules so you can learn in five minutes and start playing your first game. Unfortunately, your first game will also probably be your last as the game plays far too long for something so simple. Rolling dice in the box lid is not a bad idea as such, but in a game that is already so random, it is all a bit much and removes any element of strategy that might have existed. 1/ I collect older and out of print games, particularly fantasy themed games. 2/ I can use all the figures in Advanced Heroquest. 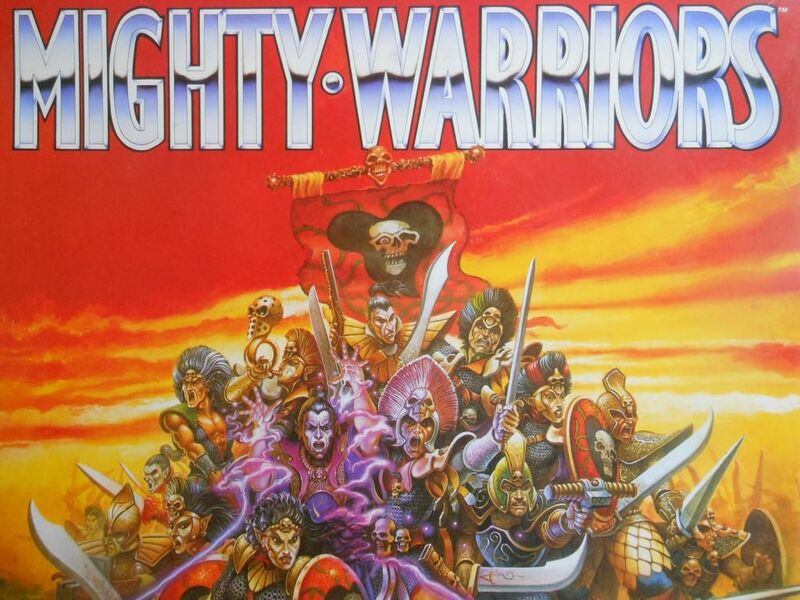 As a game in its own right, Mighty Warriors fails completely, and I have no intentions of playing it again. If you find a copy cheap somewhere it might be worth picking up, but I wouldn't recommend actively searching it out or paying the prices I have seen copies advertised for on eBay. That's all from me. Best of luck, and may all your dice land in a "hit" space. They may of intended a carry rule, clipping the shield on who ever carried it then making it home. Might of been a better idea than the Skaven having shields. I suppose the idea of the game is to make an as quick as possible dash for the opponents shield whist holding strategic points. Not necessarily killing the enemy but stunning a few on the way. You said you'd completely wiped out your opponent so that's why it took too long. There is no more explanation for capturing the shield as it simply is 'capture the flag'. Reach it, land on it's square and you win. No need for carrying rules, stunning all or whipping out the enemy in the room. You'll need to kill who ever's blocking the shield though, hence no diagonal movement through 2 enemies, strategic blocking is why that rule is specifically mentioned. You over thought the win rule, there's no more explanation as there's no more to it. The game can be floored with the blocking doors but there lies more strategy. The strategy in building the dungeon whilst planning your base and shield placement. Both players need to think about this right from picking the first few tiles and more so with the doors, detecting each others intentions and foiling them before the game even starts!!! The magic is a big fail, agreed there. The game was a cheap one, entry level and most likely as you said, repackaged surplus stock from AHQ. It's a Hit & Run game all about blocking and movement, strategy in designing the dungeon and hoping you get rolls to move quickly. Whilst you move don't forget to leave enough guards to maintain strategic dominance. It's important to figure out these strategic points quickly and hope the enemies you stun stay stunned. Do you vacate a strategic point longer to kill an enemy character or do you rush back??? Try replaying the game taking on board what I've said, possibly make a few mods, especially magic. Stick the floor tiles on thicker card and use AHQ or HQ doors, chuck the game ones in the bin, lol! I only bought the game tiles and added them to my AHQ box. That's more rooms for AHQ or an alternative Skirmish game using the same pieces. Modding the AHQ lid with more than 9 Hit Miss squares and making the rule that the dice must be rolled at 1 end/corner of the box to bounce off is also a good idea. Thanks for reading. Sounds like you have made the game work for you, but I have no intentions of playing it again, or modifying it to try to make it better. I have far too many good games that I would rather play instead. GW protects its IP fiercely, and prevents anyone distributing rules. It would crush my blog like a bug if I uploaded the rules. Your best bet is to ask around on BoardGameGeek.